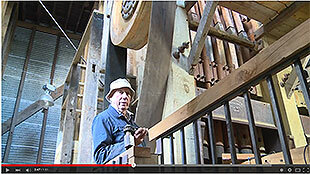 Did you miss out on Sunday's Stamper Battery opening ceremony? Well you're in luck. Click on the link below to see Goldmine Experience as featured on the evening news. As for the good looking lot who did make it, thank you for an excellent day and keep your eyes peeled for your moment of fame. 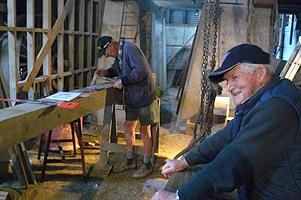 Historic gold-processing machinery, restored during 50 years of voluntary work by Hauraki Prospectors Association and supporters, is about to become fully operational. 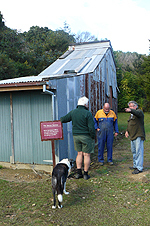 On Sunday, August 6, Thames Coromandel District Mayor Sandra Goudie, together with veteran HPA volunteer Lawrie Cobb, will officially start a refurbished stamper battery and other 19th Century plant at the group’s Goldmine-Experience site. Thames Community Board Chairperson Diane Connors will unveil an honour’s board of firms and organisations that have given money, time and other resources in the half-century of local effort and the site will open free to the public that afternoon. 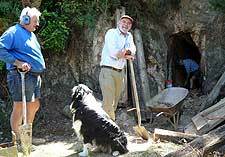 The opening ceremony is part of a 12-month-long, 150th anniversary commemoration of the Thames goldfields discovery that includes Ngati Maru, the Council, Thames Community Board, heritage groups and businesses, starting on August 1. Last year, Thames Community Board granted $22,000 towards the battery project, but most funding has come from HPA tourism income, with materials and time donated by a raft of businesses and tradespeople. 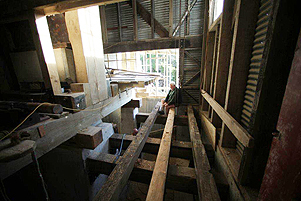 While Goldmine-Experience has run various machines over the decades, August 6 will mark the first operation of a complete 19th Century processing plant in modern times; a project that is unique in New Zealand. Five stamps will run on August 6, with another five to be installed later. Association President Carl Jensen said August 6 was the culmination of "an amazing story ". 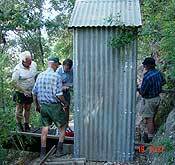 "It started in the 1960s when parts were recovered from high in the Coromandel Ranges at Neavesville where heavy stamps, stamper or mortar boxes, line shafts and berdans were disassembled, winched and carried by teams of volunteers to the top of the "Neavesville Stairway". 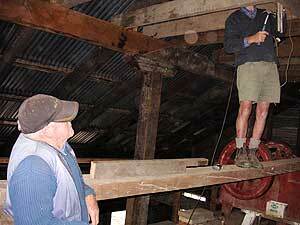 The team was visited by Auckland news media, including writer Barry Crump, with a television documentary in 1967. " 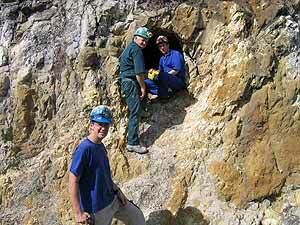 Over the past 30 years the Goldmine-Experience site has grown from one building to seven, with nearly all work still done by volunteers. 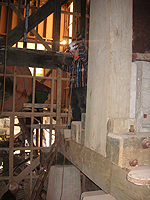 Recently they have focussed not only on the battery but also on ancillary machinery such as a crusher, two Wilfley tables, a ball mill and berdan. The next project, a working steam engine, is due for completion this year. 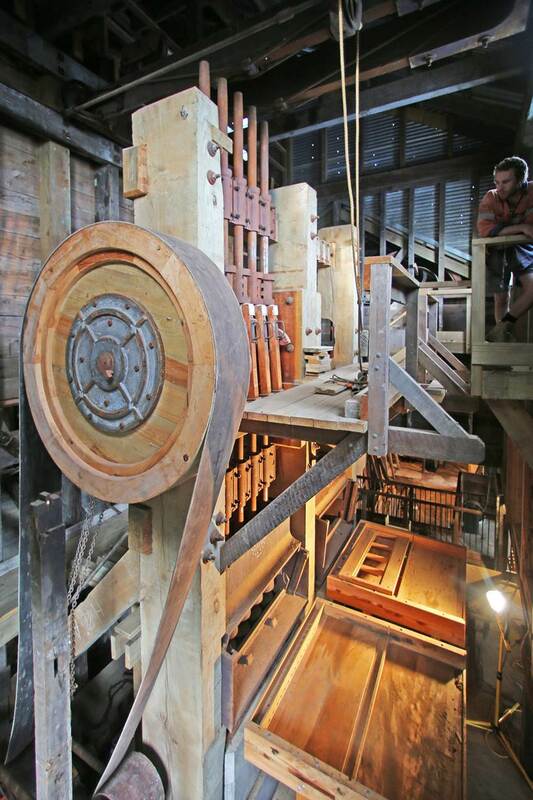 native timber provides a bird's eye view of various old machines that members are upgrading. 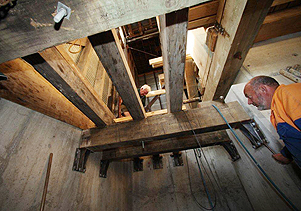 The project is a unique example of an old "ten stamp stamper battery" being replicated - with plans to include the use of steam engines. The machinery will be out of action for the next few months while the plant doubles in size with the installation of 10 Stampers. It's going to be a booming summer! 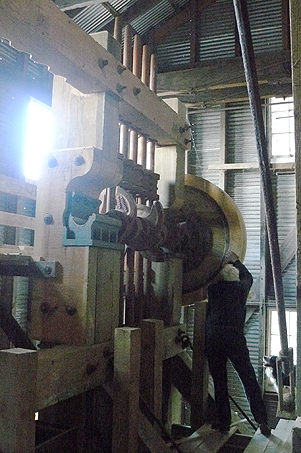 Recent weekend working bees and the odd week-days have seen major progress on the new stamper battery. A unique feature - a tourist platform or deck right around the battery - will provide an unrivalled visitor feature. 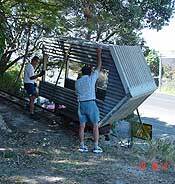 Those who helped on the deck and elsewhere on site on a recent working bee were: Alan, Eric, Hayden, Janet, Karl, Kneller, Laurie, Mark, Nelson and Peter." 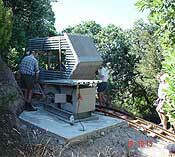 Members have been busy upgrading the mine over recent months including preparing for the next five stamps in the “new” stamper battery. 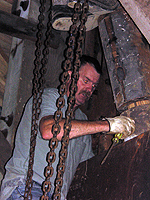 The latest working bees have focussed on heavy supports to install a steam engine as an alternate driving force, similar to the engines used in the late 19th and early 20th century. 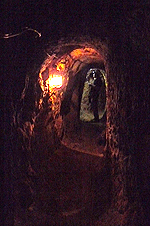 Dimmed lights have been installed in the tunnels to make the experience underground more authentic, without the need for torches. Extra solid pit-props have been added in places to make guided tours even safer. Scones, muffins and sausage rolls, a large pot of tea and lots of gold mining yarns helped make the most recent working bee a great success. 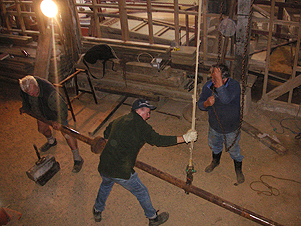 Good working bee turn-outs have led to all the stamps being installed in one of the two new five-stamp boxes and the flywheel and camshaft lifted onto the bearings on top. With the huge weights involved, this has been a major logistics exercise and went without major hitches due to good leadership by Laurie and Nelson. 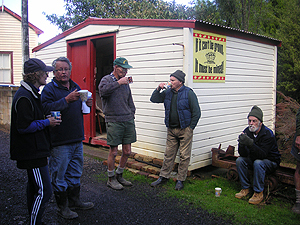 Thanks to Tararu Store for donating fish and chips for the celebratory feast after the last two stamps were dropped into position, and thanks also to lawyer and treasurer Pete for the sausages. Those who helped in the eating as well as the big stamp-lifting working bee were Brendan, Claude, Hayden, Janet, Karl, Kneller, Laurie, Nelson and Pat. As well as great weekday work recently by Laurie, Kneller and Nelson (with moral support of dogs Tim and Ace), good turn-outs of volunteers at weekend summer working bees have seen major progress inside and outside. 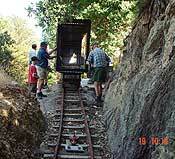 New stamps have been readied for instalation, exposed rail tracks made-safe and the adit at the site's north end has been re-opened. 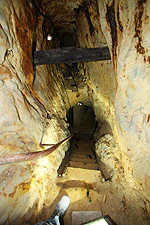 This spooky little tunnel is known to thousands of children as "The Weta Cave". Even with rock drills and picks hammering as the entrance was slightly enlarged and timbered, half a dozen wetas were stroppy enough to leave their hideaway cracks and scurry over the roof. Two particularly large and scary specimens are in residence at present, and both seem immune to the screaming of visitors. The two are so tame, they might need names. Any kids with ideas on what to call them?" 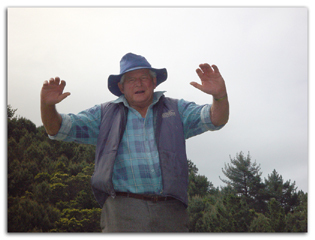 After a period of slow growth the Hauraki Prospectors are back on track - literally. 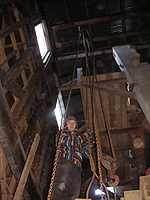 The winch house is now in position at the top of the line. The new stamps are being put in place. The details of the new plant have been comissioned and drawn up. Images will be posted soon. There is no stopping progress now. 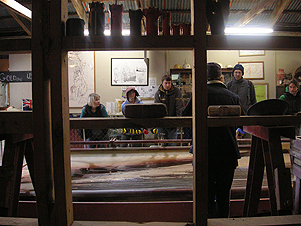 Keen members and supporters have been digging deep, but above ground as well as below. A fund-raising drive and much outside help last winter, plus hard physical work of late, has brought big achievements. Firstly we prospectors - never modest when it comes to hopes and dreams - are in sight of a large and impressive piece of reality. It’s a 10-stamp stamper battery (for extracting gold from quartz); doubling capacity from our five-stamp machine. 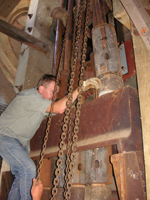 When this machine - a mix of old and new bits - is operating it will be unique in New Zealand and even just building the stamper is reviving Thames history. Ordering five new stamps from A&G Prices historic factory across the road would have been commonplace in the 19th Century, but not in 2006. 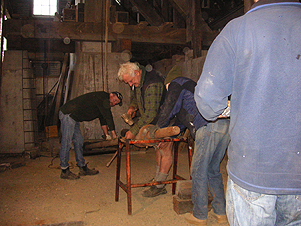 All parts – dies, shoes, bosses, tappets and stems – are now onsite and some great work has being done by Laurie, Kneller, Nelson and others to get the frame and surrounds ready. 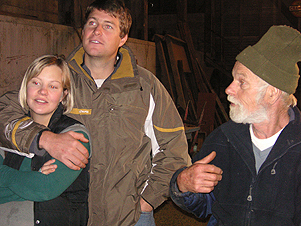 Thanks to the Chisholm Whitney Foundation for $10,000 towards this $33,000 project, Trust Waikato for $3000 to help on-going improvement of the Golden Crown shaft and Thames Community Board for $550 for the cost of underground ghosts; old miners will be heard working away in our side tunnels (one visiting 10-year-old was unkind enough to call them “just some recording system”). As if all this wasn’t enough, Rob, Rick and helpers have been busy with maintenance work underground as well as building an impressive mine-to-tip-head rail line , the wiring whiz Dave has refurbished our power installations and last but not least president John and Colin have made great progress on restoring the Sawyer Battery – a rustic little building at the site’s north end. 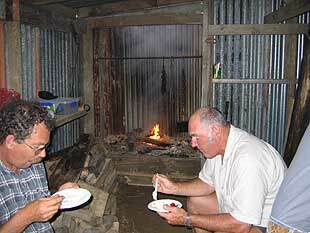 We celebrated the year’s successes, in style, around the Sawyer Battery’s rebuilt fireplace last month: In the time-honoured way of course, with tall stories… and camp-oven stew. those regulars mentioned above a little extra help. 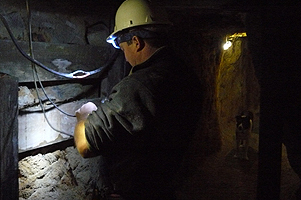 As always - strong lights were shone on recently-cleared underground walls near the battery building. There's gold in them thar hills... somewhere!" 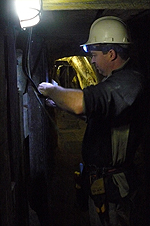 Underground work has slowed with the mine reopening each day for visitors after the busiest winter and spring of recent years for members inside – away from the wind and rain – with tunnels widened, extra supports added and a large "room" dug out and timbered near "Robert" - one of our display manikins. Ace, Dave, Elved, Haydon, John, Ricky, Rob and Thomas were the main volunteers who hacked into rock with the help of search lights and jackhammers. Even a chainsaw was tried! No less than 25 square metres of rock was taken out and sifted through and while no-one yelled Eureka!, the gold is whispered to be just inside a wall somewhere - ready to be discovered, next time." Efforts are being made vertically too. 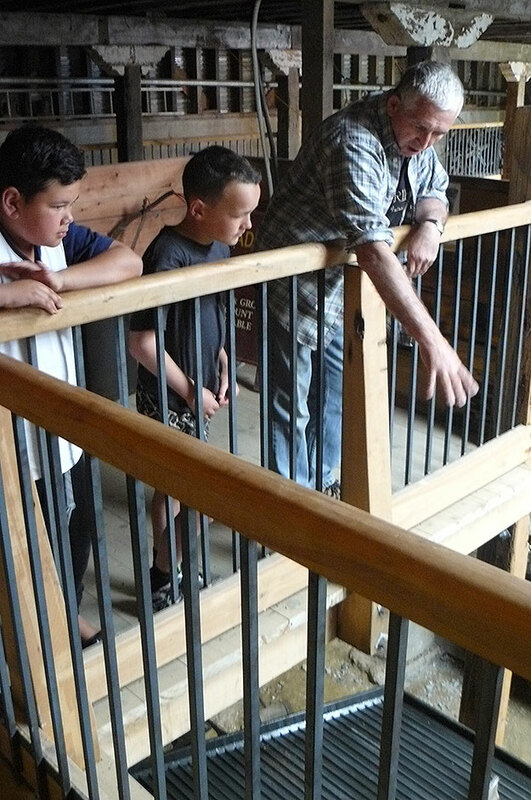 Thomas and Hayden abseiled down the shaft near the mine entrance, with Nelson completing blueprints of the shaft's planned "poppethead" - a wooden tower-like structure which will "relive history" as such structures were a Thames icons. Poppetheads commonly stood over mine shafts around town. 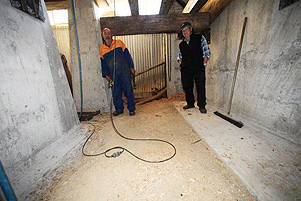 To add to the extra effort in recent months, Russell has taken to the site and buildings with broom, shovel and paintbrush. It's looking tidy! ALL WORKING ON THE RAILROAD. Glenn, Hayden, Laurie, Nelson and Thomas - and of course Tim the dog - have been scrambling around the hillside behind the battery in recent weeks. Tonnes (well, when carrying those old steel tracks up the hill they feel like tonnes) of sleepers and railway tracks have been laid. The railway is now almost up to a planned rail bridge which will go from an old cliff-side tunnel to an ore-shoot on top of the battery building. 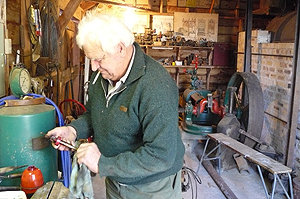 In the meantime Kneller and Laurie have put finishing touches to a sentry-box type gateway for the railbridge, while the poppet head has been left in Ken's capable hands for now. 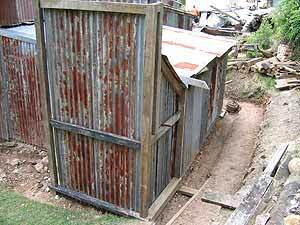 The professional builder is organising above-ground and underground timbering. Too many projects, too little time! 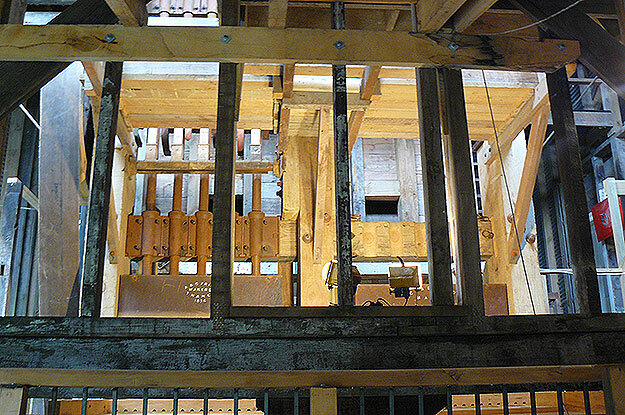 A FLURRY OF ACTIVITY over the summer has centred around the old 50-meter-deep shaft near the mine entrance, with several members working on finishing the new poppet-head and lining for the hole. Younger member Hayden Francis meanwhile has just had bought an expensive - $500! - body harness after volunteering to be first one down for maybe 100 years or more. Hayden will be armed with a headlamp and candle - the candle to ensure there's oxygen down there. If the candle goes out, he may be hauled back up (depending on how politely he asks). Hayden is becoming one of the association's top explorers, after organising other members - Paul, Ash, Thomas and Elved - for crawls through rediscovered old workings last year (see Nov 02 below). Unfortunately, the lower tunnel ends after only about 15m because of a wall of back-fill, and oxygen is still a little scarce down there. As always, the association is looking at other ways down!" AN EXPLOSIVE TIME! The old stamps had finally gone kaput. 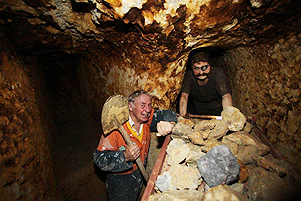 It was time for some major maintenance at the mine. Henry Donaldson - local explosive expert (construction blasting) was called in to blast off a stamp head. (unsettling some local residents with the loud bang). An adaptor was then welded to the stamp shaft, screens repaired, and stamps re-set. STEAMING AHEAD. 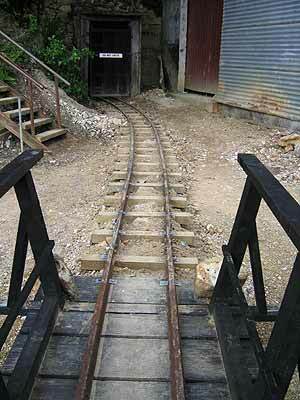 Railway track now is laid to the top of the hill. 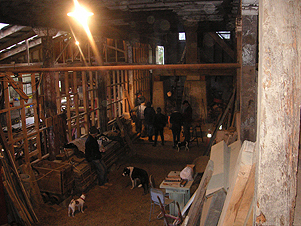 Nelson, Laurie, Hayden, and Tim (the dog), are shown laying the sleepers and nailing down recycled rail track. TRACKS ARE MADE ON THE RAILWAY TRACK. Volunteers installed another power pole into the bank. 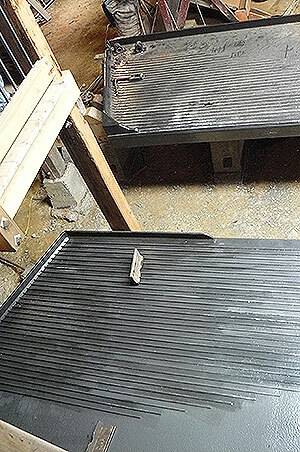 Railway sleepers have been cut and will be laid down sometime soon. Also, mine trucks are under construction by Laurie. 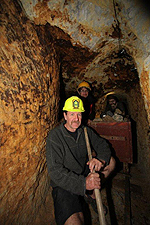 Goldmine Experience operates independently from Hauraki Prospectors Association Incorporated.